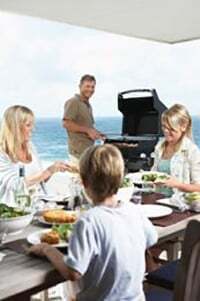 Each grilling season, traditional cuisines, like hamburgers and hotdogs, rule the day. However, don’t forget that there are many other ways to liven up your grill. *Introduce bacon to the grill. Tradition states that bacon is typically a breakfast side. But what about other meals? No longer does bacon have to be cooked by itself on the stove top or in the microwave. Bacon is fast becoming the unlikely go-to ingredient to pair with a variety of ingredients such as ice cream, chocolate and even alcohol. Instead, bring this savory trend to the grill this summer. It can make for a tasty accompaniment to any meal. *Think outside the (pizza) box. When pizza is on the menu, it’s sure to satisfy the whole family — especially when it’s cooked on the grill. To get that crisp wood-fired taste, try pizza paninis — all you need are bread, pizza sauce, pepperoni slices, mozzarella cheese and any variety of meats and vegetables that fits each person’s tastes. You can even make a unique combo of barbecue chicken or pork with shredded meat, red onion and cheddar. Or, put out a variety of veggies, meats and cheese, and people can create their own personal pizza. *Import island flavors into your home. Bring home the love affair of the south seas and Hawaii with inspired cuisine, such as a teriyaki SPAMburger, featuring a delicious combination of SPAM and pineapple that offers island-inspired flavors. For more innovative grilling ideas, visit www.HormelFoodsRecipes.com.